The way metal art sculptors make metal statues these days out of modern industrial refuse, you’d think that metal art was a modern thing. But it isn’t. It has been around for hundreds of years. Throughout history, metal art has been a part of architecture everywhere – palaces, places of worship, street art, fountains, you name it. Of course, ancient metal art is not something you see around North America. In Europe though, it’s everywhere in all the wonderful cultural capitals. While it may have temporarily gone out of style, it certainly is making a comeback these days – in the form of metal garden art. Anyone who’s done a good bit of landscaping knows that good garden design requires that you do it so that your garden focuses on a permanent structure or two – a tree perhaps, or fountain or something. 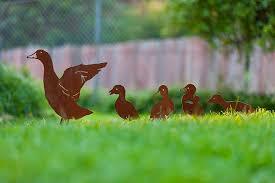 To fans of metal garden art, that permanent structure can be a metal statue of some kind. Metal garden art doesn’t always have to be an artistic statue. Some garden designers like to go for something functional – like beautiful wrought iron garden furniture that’s fixed in place. A wrought iron fountain isn’t a bad idea either – it brings a touch of classical old world beauty into your garden. Or else, your metal garden art could be actual statues. What you need to do is to find a work of art that really appeals to your tastes. You need to walk around your garden, and think about what kind of metal garden art would really bring everything together. You could get a beautiful metal bell to hang off a tree branch. Or you could get metal flamingoes. A metal screen made of wrought iron could be very beautiful too. If you want some real ideas on what can be done with metal garden art, you need to look the Royal Botanical Garden of Burlington, Ontario up on the Internet. They’ve really gone all out there– huge metal men with tuxedos on, a beautiful scarecrow made a bronze, a huge metal spider in a huge metal web – it’s quite whimsical and it’s quite beautiful. There’s something permanent and timeless about metal sculpture. Just finding a metal dog or a metal flower in your garden can bring a kind of ageless beauty in. You’ll suddenly find yourself looking at your garden in a different way. These days, it is all about industrial refuse – car parts, gears and so on. Art made out of discarded bicycles are all the rage now. Even the rusted metal is considered cool. In fact, gardeners these days actually look for pre-garden rusted metal art.